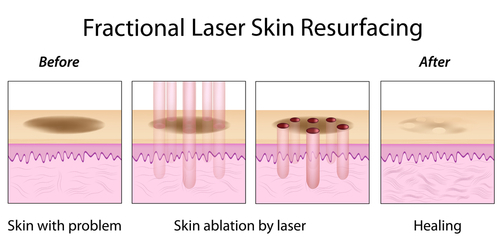 How Does Fractionated Laser Skin Resurfacing Work? Laser skin resurfacing targets aged and damaged skin to produce smoother and firmer skin with a more youthful complexion. The fractionated CO₂ laser skin resurfacing procedure works by removing damage on the outer layer of skin (epidermis) while stimulating the body’s natural production of collagen deeper in the skin. The powerful laser ablates the flaws on the skin’s surface and penetrates the deeper layers to vaporize microscopic areas of damage. This actives the regeneration process, in which the body grows new, healthy tissue. The laser leaves fractions of healthy skin, which also aids in the healing process. After the procedure, the healing process may require one to two weeks of downtime. The skin may be red, swollen, and have some crusting for the first week, and during the second week pink, youthful skin will emerge. Patients should avoid direct sunlight until the skin is fully healed. Dr. Wise will then create a customized skin care regimen to ensure a proper recovery and help maintain results. The Erbium-Yag Laser Peel, which targets more superficial layers of the skin, is sometimes combined with fractionated CO₂ laser skin resurfacing to provide more comprehensive rejuvenation. Surgical procedures, such as a facelift, also often combine a laser skin resurfacing treatment to achieve skin that is as youthful as the lifted tissues. At the Wise Center for Plastic Surgery, we evaluate each patient’s unique circumstances to determine the best procedure to meet his or her needs. If you are interested in improving signs of aging and achieving youthful, radiant skin, please call (888) 295-6933 or fill out our online contact form today. Dr. Jeffrey Wise is ABPS Board Certified in Plastic Surgery as well as board certified by the American Board of Otolaryngology – Head and Neck Surgery.